The third day of my unplanned trip and I was engrossed in an unending Jenga game at Zostel Dharamkot. It was only after someone with poor architectural skills placed an unbalanced block and caused our building to collapse without the need for an earthquake that we got some respite. To get over the loss of such beautiful building we decided to play a game of Bluff using three decks. Eventually, the wall clock at Zostel struck 0130, only to remind me that I had only 5 hours to snore before I could begin my trek to Snowline Cafe. It was already 0800 when I realised that I should probably stop snoring and start trekking to Snowline cafe. The morning sun at Zostel Dharamkot was kind enough to relax my confused mind and aching feet. Yet, it was only after an hour and a half that I had the energy to leave the hostel and begin hiking towards Gallu Temple. Tinku, the owner of Rest-a-while cafe has always been patient enough to lend his ear to my adventurous desires. This time he was kind enough to arrange a guide for me who would take me to Snowline cafe using the 'Road Less Travelled' route. (Ed: Since you are the first one to write about this route we will refer to this as "Sarthak Route"). I've been brooding over this route for a long time now but, I only decided to do something about it at the last minute. So as usual everything was unplanned and fortunately for me being unplanned was my plan. Route in Orange is the original route to Triund and beyond. While the route in Green is what we took. Reproduced with permission © Sarthak Ohri. 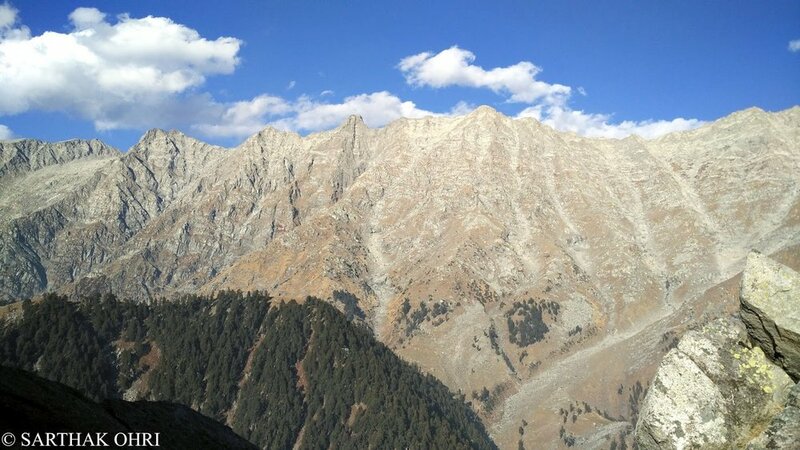 The much-used route to Snowline Cafe follows the slope to the right of this hill via Triund. 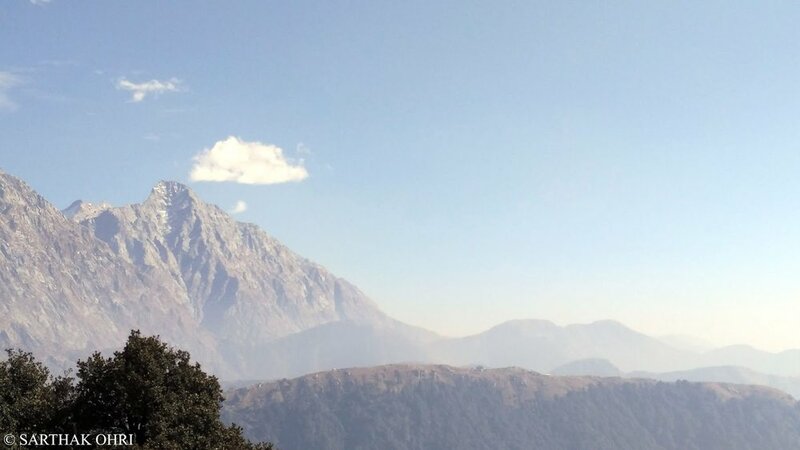 My route to Snowline Cafe was a much more direct route following the ridge that connects Galu temple with Triund. There are three major landmarks i.e. three temples - each of them painted white and perched on a rock. I had followed this route midway to the first temple in June 2016. There I had to abandon my climb due to a snake and clouds. You can read more about that journey here. A shelter worth spending a night. Reproduced with permission © Sarthak Ohri. Approaching the First temple - Durga Temple. Reproduced with permission © Sarthak Ohri. This time I reached the first temple dedicated to Goddess Durga well before my scheduled time. The route is steep but the trail is clearly visible in winters as the trail was not covered with leaves (unlike monsoon and autumn). This temple is rated as the best viewpoint by Bharat and it certainly is. This route is all about being close to nature and experiencing solitude. A hundred metres before the temple are a few natural caves which were a temporary abode for goatherds and cowherds. My guide tells me that one member of this family would descend to Dharamkot every day to sell milk, while another member would be on cattle protection detail. Best Viewpoint just an hour away from Mcleodganj. Reproduced with permission © Sarthak Ohri. Behind the temple is a vast meadow with picture perfect views of Dhauladhar and the Kangra valley. I was caught between the urge to catch a shuteye and to reach my destination before dark. On a new route, wild animals could be expecting you for dinner or perhaps you chance upon a beautiful landscape that welcomes you. You never know what's beyond because what lies beyond is always a mystery. If you venture on a new route it is imperative to make the most of daylight. The trail ahead and the weather conditions are unknown variables. The trail to the next temple is quite treacherous and is often regarded as the most difficult patch of this trek. On this narrow trail, you gain significant altitude while passing through a dense forest. A lot of locals and my guide reckons that this patch is prone to a lot of wildlife encounters. All jungle book characters were crossing my mind on this trail. However, I soon realised that I had a werewolf walking right beside me. Yes, you read it right, My guide was a "werewolf" - his sense of smell was so powerful that he could smell humans who had left this spot a couple of minutes/an hour ago. In fact, he could sniff and guess the brand of 'beedi' (cigarette) those guys had smoked. Me - I was struggling hard panting to allow in some fresh air into my lungs. After a while, my guide started to whistle. A whistle that was loud enough to get a reply back (not an echo though, but a real one) from three foreigners who were hundreds of meters ahead of us. Finally, after a lot of quick hiking, we reached the second temple. This looked similar to the first one and a beautiful and vast camping site next to it. This is also where we met the three 'Bullet Train Hikers'. A girl was guiding two guys along this route. Second temple 'On the rocks'. Reproduced with permission © Sarthak Ohri. Camping site before second temple. Reproduced with permission © Sarthak Ohri. Our concerns about three unguided foreigners hiking in this ill-defined route quickly vanished when my guide saw the girl leading the group. She had been on this route multiple times and was now guiding other foreigners to this route (perhaps for few dollars). I call the group the "bullet train hikers" because they trekked at a pace so fast that for a while I thought they may cross Indrahar Pass and have evening tea at Chamba. Nevertheless, in the end, the Bullet Train ran out of fuel and fell exhausted at 'Ilaqa Got'. Again the overwhelming urge for a short nap but my guide caught my eye and I understood it was time to move on. This was a place to admire the Kangra Valley and the entire Dhauladhar range. Cirrus clouds were adding charm to the landscape while I noticed a flock of birds passing by. I cannot wait for someone to gift me with a DSLR to capture these fine vistas. (Ed: I think you're doing a great job with the gear in hand). Dhauladhar Matterhorn to the right. Benefits of hiking on a ridge are that you can see the both sides. Reproduced with permission © Sarthak Ohri. From this point, the route means following the ridgeline. The ridgeline is dotted with small hills which give a roller coaster feel. Every time I climbed higher a hill higher than I was standing was awaiting me. After a half hour through a semi-dense forest, we reached a plateau where we had our packed lunch. After lunch, my guide surprised me by telling me that there were three more hills to climb before we could reach Kunal Pathri temple. I didn't have the urge to climb anymore, but could I do that? Of course not! By now Triund ridge was visible at a distance and the cacophony of weekend revellers could be heard. It was already 1330 and based on experience I roughly allocated one hour for each hill. The forest was extremely dense and the undergrowth wet with melting snow and slush. By 1430 we had summited both the hills and were climbing the third one. Just 100 meters before our last religious checkpoint the mighty Dhauladhar were spread before me and we decided to spend few moments there staring at nature's bounty. At 1505 we reached Kunal Pathri temple and we surrendered our souls to the mesmerising view, the temple deity and the sun. Finally, I fell into a short catnap and left my shoes to dry in the bright sun. Few metres before Kunal Pathri temple. Reproduced with permission © Sarthak Ohri. Views from Kunal Pathri Temple. Reproduced with permission © Sarthak Ohri. 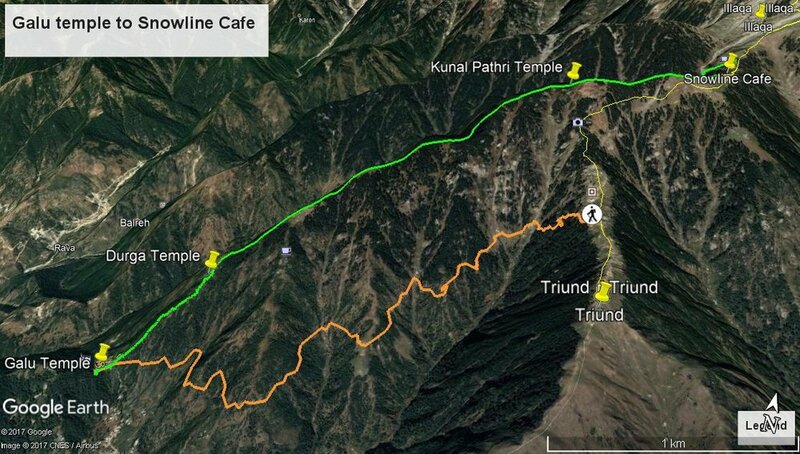 After half an hour of sunbathing, we descended for snowline cafe which was just 10 minutes short walk from the temple. Snowline cafe looked as usual and the best part was that it was away from the chatterboxes at Triund. Manu - snowline cafe's manager, welcomed us and when we told him about our novel new route his eyes lit up. Like an elder brother who would take care of a younger sibling when he returns home after a difficult march - his generosity knew no bounds. In another hour my group of friends from Zostel joined with their guide 'Panda'. Together we all went on to have a lovely evening in the lap of Dhauladhar creating some interesting moments which affected my next day's Moon Peak climb. But that's a story for another day. Finally- The 'Sanow Line Cafe'. He should rectify his signboard now :p Reproduced with permission © Sarthak Ohri. The Sun sets on Dhauladhar at Snowline Cafe. Reproduced with permission © Sarthak Ohri. 1.5 to 2 Litres of water per person as there is no shop or a water source en route. Hiking poles for grip over few slippery patches of grass and slush. Beware of wild animals. I have been hearing Jungle Book stories on this route especially when people venture alone especially in late evening. Every Jungle book character tries to maintain a fair distance humans provided humans do their best to keep away them away. Frequent whistles work well. The route is all about gaining altitude and is moderate. It is always better to plan a turnaround time on new routes where you have no chance of finding any help. This article first appeared on Devil In Himalayas. It has been edited by Bharat Singh Bhadwal and reproduced here with due permission from the author - Sarthak Ohri. You can follow Sarthak on Instagram @the_joyful_backpacker. "I am a thought that wanders, wanders with a desire. A desire to explore deep within my soul. Cycling through the thoughts my journey goes on, Higher and higher to the pedestal of my soul." The author is an adventure seeker and a passionate writer writing the story of his life with colourful moments.